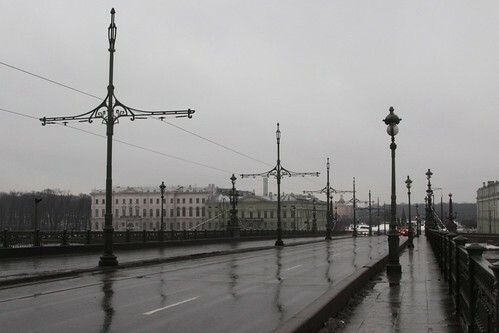 When I visited Saint Petersburg finding trams in the ‘city’ proper was difficult, but I did find disused tram tracks crossing the Trinity Bridge (Тро́ицкий мост) over the River Neva. 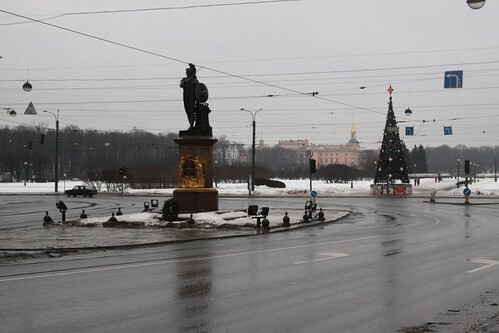 These tracks continued south from the bridge, skirt the statue at Суворовская площад (Suvorov Square). Wikipedia has a track map of the Saint Petersburg tram network dated 2013, and it lists the tracks across the River Neva as “Участки трамвайных путей, не используемые для перевозки пассажиров” – tracks not used for the carriage of passengers. I found a 1982 photo of trams crossing the Trinity Bridge on Wikipedia, by ‘Smiley.toerist’. 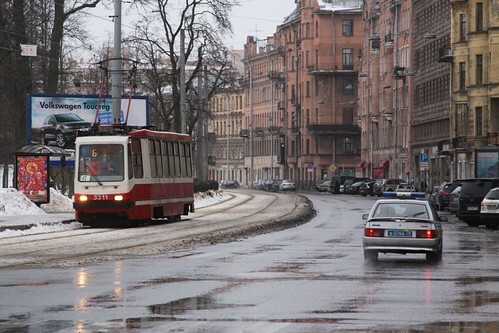 This entry was posted in Trams and tagged abandoned, disused, Russia, Saint Petersburg. Bookmark the permalink. Strange they were closing tram lines in the 80s and have kept going, a time when everyone else started building them ! Guess they thought / think trolleys cheaper / better, or everyone should be catching the metro, though that’s barely expanding. Have always been surprised that St Petersburg was (until recently) the largest / longest trackage (double or single ? I think most figures are about double track, very few systems have single track lines) – all other european cities have much shorter lengths, even when the system is quite dense. I think this is because St Petersburg’s lines built to the far edges of the prefab apartment building suburbs built up to the 1960s (no cars…). Yep, Russian wikip article confirms this, whereas the english one says not expanded after the 30s. Hmm, in fact they go pretty much to the edge of the city now – guess St P hasnt expanded like moscow ! (which had 400km in the 20s, but it didnt expand in the 50s-60s reputedly cos Stalin didnt like them). So if Moscow hadnt abandoned them, the system would have been huge ! Meanwhile, Melbourne’s, being a system built for low density suburbs, and the only modern western one to survive (along with Toronto), is now the largest. Love that. While tram systems are big across Russia, a common theme was the dismantling of trams routes once a metro line was built along same corridor – resulting in a ‘hollowed out’ network.